Severe food insecurity affects eight per cent of the population of Ouham-Pendé, Central African Republic, while another 48 per cent are just moderately food secure. Against the backdrop of a continuingly complex humanitarian scenario in the Central African Republic (CAR) – marked by multiplication of hotspots, increased displacement and growing needs – the head of United Nations humanitarian operations in the country today released $9 million for the most urgent and critical relief operations. However, even with this new funding, overall resources in the country remains a mere 14 per cent, said the UN Office for Coordination of Humanitarian Affairs (OCHA) in a news release today. “An adequate level of funding of humanitarian activities remains an absolute priority, otherwise, CAR risks relapsing into an acute crisis,” warned the UN humanitarian wing. In the news release, Najat Rochdi, the Humanitarian Coordinator for the country, who released the funds thanked the donors who haves supported response and reiterated her call for increased resources. “It is the peace process consolidation which is at stake,” she noted. The latest tranche will support efforts in Basse Kotto, Mbomou, Nana Gribizi, Ouaka and Ouham-Pendé provinces, where between September 2016 and March 2017, flare-ups in the situation have resulted in massive displacements and severe challenges, including for protection of civilians. The projects targeted in the latest release include responses in the education, protection, health, nutrition and water, sanitation and hygiene sectors as well logistics, shelter and non-food items, coordination and site management. In the Humanitarian Response Plan for CAR, UN and relief partners had appealed for nearly $400 million to support more than half the country’s population who are dependent on humanitarian assistance for their survival. According to UN figures, between February and March this year, the African nation has seen a nearly 6 per cent increase in the number of newly displaced people from 401,072 to 426,100. The security situation in the country too has seen a rapid deterioration. On 8 May, eight peacekeepers from the UN Multidimensional Integrated Stabilization Mission, known by its French acronym MINUSCA, were killed when their convoy was attacked by suspected anti-Balaka elements near Bangassou, about 474 kilometres east of the nation’s capital, Bangui. Clashes between the mainly Muslim Séléka rebel coalition and anti-Balaka militia, which are mostly Christian, plunged the country of 4.5 million people into civil conflict in 2013. 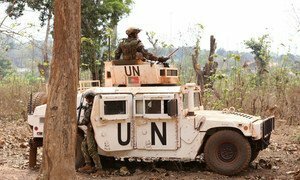 United Nations Secretary-General António Guterres has strongly condemned an attack against a convoy of the UN peacekeepers in the Central African Republic (CAR) that left four dead, one missing and 10 others evacuated.